Tomi Adeyemi has already achieved greatness and she’s on her way to so much more!! She has been compared to extremely accomplished authors and this book was picked up to be adapted into film BEFORE IT WAS RELEASED!!! Oh, and did I mention she also signed a 7-figure book deal all at the age of 23? 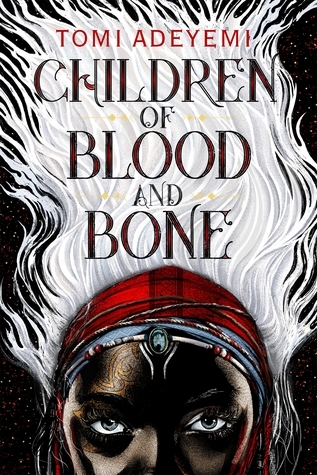 Children of Blood and Bone tells the story of a young girl named Zélie who goes on a quest to bring magic back to Orïsha with the help of her brother, Tzain, and the princess of Orïsha, Amari. The king of Orïsha has a strong hatred for maji and once ordered everyone who possessed magic to be killed, including Zélie’s mother. Add in the fact that the king sends his son and future king, Inan to go after the three and the task of bringing magic back seems almost impossible. Every paragraph was rich, filled with soul, and devastatingly beautiful. I had to stop reading so many times just to express my love for Ms. Adeyemi’s writing!!! YA Fantasy needs more exciting books like this! I can’t wait to read more from this author. When I was a teenager, Harry Potter was the biggest and most popular book and movie series. I believe the Legacy of Orïsha series will be just as popular among today’s teens. This series is going to be the next cultural phenomenon and I can’t wait to see Tomi Adeyemi achieve more and more much deserved success. Important topics were also brought up in this novel such as colorism and police brutality among the Black community. My heart ached for Zélie and her people. Knowing that how the maji were treated is all too real for Black people made it that much more painful. The maji were hated, oppressed, sometimes enslaved, and even killed because of the prejudice against them. This book is so important and I can’t imagine what Adeyemi felt as she wrote it. The characters and their development was outstanding. One of my favorite aspects of this novel was the friendship between Zélie and Amari. Two young girls, who the world believes should hate each other, threw prejudice aside and a heartwarming friendship blossomed. Seeing these two girls share something so pure amidst so much hatred and danger filled me with hope and love. This is a book that everyone needs to read regardless of whether or not you enjoy this genre, or even enjoy reading at all. I seriously cannot get over how much I loved this book and these characters!! By the end of this novel, I had tears in my eyes and I kept praying, just one more chapter! Ms. Adeyemi has created a masterpiece and I will be (very) impatiently waiting for book two in the series, Children of Virtue and Vengeance!